Hear the word that the Lord hath spoken concerning you, O ye children of Israel: concerning the whole family that I brought up out of the land of Egypt, saying:  You only have I known of all the families of the earth: therefore will I visit upon you all your iniquities. Shall two walk together except they be agreed? Will a lion roar in the forest, if he have no prey? will the lion's whelp cry out of his den, if he have taken nothing? Will the bird fall into the snare upon the earth, if there be no fowler? Shall the snare be taken up from the earth, before it hath taken somewhat? Shall the trumpet sound in a city, and the people not be afraid? Shall there be evil in a city, which the Lord hath not done? For the Lord God doth nothing without revealing his secret to his servants the prophets. The lion shall roar, who will not fear? The Lord God hath spoken, who shall not prophesy? Publish it in the houses of Azotus, and in the houses of the land of Egypt, and say: Assemble yourselves upon the mountains of Samaria, and behold the many follies in the midst thereof, and them that suffer oppression in the inner rooms thereof. And they have not known to do the right thing, saith the Lord, storing up iniquity, and robberies in their houses. Once again, the Prophet Amos was prophesying about the fate of the northern kingdom of Israel (he, a native of the southern kingdom of Juda, had been sent to the northern kingdom to announce his prophecies) that would befall it because of the people’s infidelity and unrepentant sins. Nonetheless, however, the Prophet Amos’s words, which were, of course, written under the inspiration of the Third Person of the Most Blessed Trinity, God the Holy Ghost, are certainly useful to reflect upon during the terrible chastisements that are being inflicted now in various parts of the world, including in California as wildfires in the northern and southern parts of this socialist “paradise” that aggressively promotes and forces taxpayers to subsidize all manner of wickedness under the cover of the civil law while forfeiting many of their legitimate property rights. More questionably, the message lauded Gov. Brown—a darling of Planned Parenthood and zealous advocate for abortion on demand—as a “leader who seeks the good of the people defending the dignity and freedom of each person.” The Tweet ends with a triple emoticon of human hands clasped in prayer. The Vatican has twice offered Governor Brown a platform to preach his ideas, inviting him on two separate occasions to address an assembly of clerics and lay people on issues related to global warming. Although as a young man Brown was a Catholic seminarian with the Jesuit order, he sees no contradiction between his Catholic credentials and his crusade for abortion. The State of California accounts for a disproportionately high number of U.S. abortions, and although only 12 percent of the national population lives in the state, 29 percent of all the nation’s abortions take place there. This means that the abortion rate in California is well over twice that of the national average. The Pontifical Academy for Science is run by Argentinian Bishop Marcelo Sánchez Sorondo, who came under fire in May of 2016 for offering a Vatican platform to other known advocates of abortion and population control, like Jeffrey Sachs and UN General Secretary Ban Ki-moon, as well as population hoaxer Paul Ehrlich. Marcelo Sanchez Sorondo got one thing right: he is only the “chancellor” of the blaspheming heretic he serves, Jorge Mario Bergoglio, who admires the likes of “Jerry” Brown and, among so many others, Andrew Mark Cuomo, the Governor of the Socialist Republic of New York. Jorge wants men such as Brown, Cuomo, Jeffrey Sachs, Paul Ehrlich, Ban Ki-moon and others, including those directly affiliated with the atheistic Jewish-born globalist billionaire, George Soros, to receive the official “blessing” of the counterfeit church of conciliarism. This is his way of denigrating everyone in public life who is “pro-life” and of setting an example for “conservative” “bishops” within the conciliar structures to stop praising the initiatives, no matter how flawed and partial they may be, of the administration of President Donald John Trump to limit the harm caused by the daily slaughter of the preborn. This is all the work of Antichrist as every single bit of it is anti-Christ. Of course, 10 years is hardly enough to establish a long-term trend. Nevertheless, the 10-year cooling period does present some interesting facts. 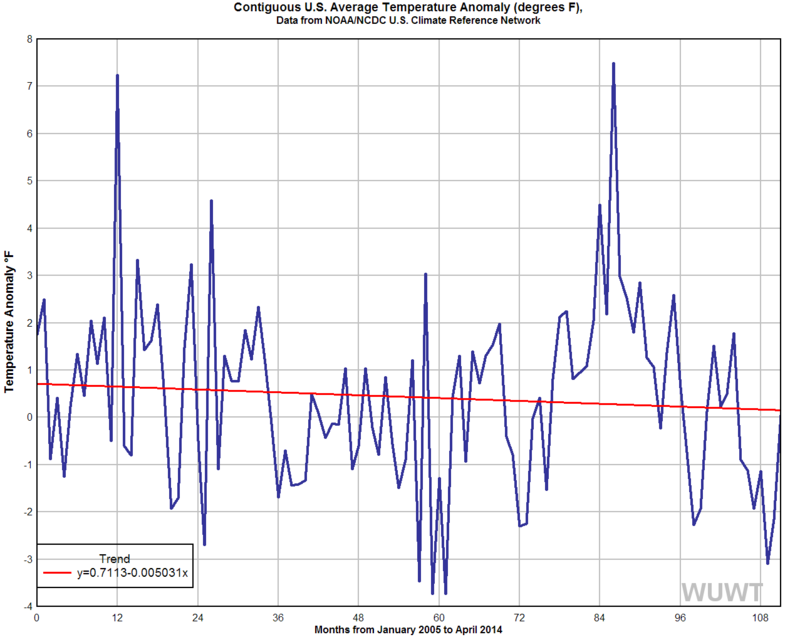 irst, global warming is not so dramatic and uniform as alarmists claim. For example, prominent alarmist James Hansen claimed in 2010, “Global warming on decadal time scales is continuing without letup … effectively illustrat[ing] the monotonic and substantial warming that is occurring on decadal time scales.” The word “monotonic” means, according to Merriam-Webster Online, “having the property either of never increasing or of never decreasing as the values of the independent variable or the subscripts of the terms increase.” Well, either temperatures are decreasing by 0.4 degrees Celsius every decade or they are not monotonic. Second, for those who may point out U.S. temperatures do not equate to global temperatures, the USCRN data are entirely consistent with – and indeed lend additional evidentiary support for – the global warming stagnation of the past 17-plus years. While objective temperature data show there has been no global warming since sometime last century, the USCRN data confirm this ongoing stagnation in the United States, also. Third, the USCRN data debunk claims that rising U.S. temperatures caused wildfires, droughts, or other extreme weather events during the past year. The objective data show droughts, wildfires, and other extreme weather events have become less frequent and severe in recent decades as our planet modestly warms. But even ignoring such objective data, it is difficult to claim global warming is causing recent U.S. droughts and wildfires when U.S. temperatures are a full 0.4 degrees Celsius colder than they were in 2005. Even more importantly than the facts above, the USCRN provides the promise of reliable nationwide temperature data for years to come. No longer will global warming alarmists be able to hide behind thinly veiled excuses to doctor the U.S. temperature record. Now, thanks to the USCRN, the data are what the data are. Expect global warming alarmists, now and for the foreseeable future, to howl in desperation claiming the USCRN temperature data are irrelevant. What do facts mean to the lords of Modernity who are steeped in the throes of the adversary’s influence, whether directly or indirectly? This is all undoubtedly true. To amplify the truths told by Mel Gibson, who has had to deal with his own demons of lust and alcohol over the years, I was told by the Catholic gentleman who served as the chairman of my campaign for New York State Right to Life Party senatorial nomination in 1998 that he had been in the office of a major motion picture studio executive in Hollywood, finding the man’s office darkened and illuminated only by the light of sanctuary lamp that burned before an image of the devil himself. No, I am not making this up, and the man, who is truly a victim soul now after having been partially paralyzed by a medical procedure that caused him to have a stroke, is not prone to story-telling. How can any Catholic justify partaking of so-called “entertainment” produced by Hollywood that is under the control of satan himself? It is to take nothing away from the tragedy of epic proportions that has taken the lives of at least forty-two people now and burned hundreds of homes in California as a community named “Paradise” was burned to the ground to state the simple truth that such disasters are the result of the epidemic of unrepentant sin in the world. God will not be mocked. Sin must be punished. For where there is a testament, the death of the testator must of necessity come in. For a testament is of force, after men are dead: otherwise it is as yet of no strength, whilst the testator liveth. Whereupon neither was the first indeed dedicated without blood. For when every commandment of the law had been read by Moses to all the people, he took the blood of calves and goats, with water, and scarlet wool and hyssop, and sprinkled both the book itself and all the people, Saying: This is the blood of the testament, which God hath enjoined unto you. Our Blessed Lord and Saviour Jesus Christ shed every drop of His own Most Precious Blood to redeem us. Though innocent, the Second Person of the Most Blessed Trinity made Man. We are called to make reparation for our own sins and those of others, something we must bear in mind at all times even when facing epic chastisements such as those afflicting California at tis time. Once again, while taking not a thing away from the physical and emotional suffering that has afflicted so many in California at this time, a suffering that must be relieved by our prayers and by whatever temporal assistance can be rendered unto them, we must recognize that no suffering, not even that which has resulted in so much devastation in the Golden State, is the equal of what one of our least Venial Sins caused Our Blessed Lord and Saviour Jesus Christ to suffer in His Sacred Humanity during His Passion and Death and that caused His Most Blessed Mother's Sorrowful and Immaculate Heart to be pierced through and through with those Seven Swords of Sorrow. Catholics who love God as He has revealed Himself to us exclusively through His Catholic Church give thanks to Him for each and every cross and humiliation that He sees fit to fashion for the. Each and every cross that the good God sends us is the means by which we are meant to give Him honor and glory through the Sorrowful and Immaculate Heart of Mary. Each and every cross that the good God sends us is the means by which we are meant to make reparation for our own sins and those of the whole world, praying with urgency for the unconditional conversion of all non-Catholic to the true Church before they die and praying for the return of lapsed Catholics to the bosom of Holy Mother Church before they die. Each and every cross that the good God sends us is the means by which we can give salutary example to lukewarm Catholics and to all non-Catholics that God never permits us to endure any cross that is beyond our capacity to carry by means of the graces that His Co-Eternal and Co-Equal Son, Our Blessed Lord and Saviour Jesus Christ, won for us by the shedding of each and every drop of His Most Precious Blood on the wood of the Holy Cross and that flow into our hearts and souls through the loving hands of His Most Blessed Mother, she who is the Mediatrix of All Graces. Catholics rejoice in their crosses. Catholics rejoice when they are castigated and humiliated and misunderstood and calumniated. Catholics rejoice when they are denied temporal honors and worldly success. Catholics rejoice when they are deemed worthy to suffer some terrible physical or emotional affliction as this means that God has seen fit to make it more possible for them to pay back what they owe for their sins in this passing, mortal vale of tears and thus to do their Purgatory on earth. Mind you, by way of reiteration, this is not to denigrate or to minimize in any way the tremendous suffering that is taking place in California at this time. This is, however, remind the very few readers of this little-read website that we are supposed to look at each of the events in our own lives and in the world through the supernatural eyes of the Holy Faith. The loving hand of the good God is seeking to chastise us. God is seeking to humiliate us in order that we might rely more fully upon Him as He has revealed Himself to us exclusively through the Catholic Church. God is seeking to remind the creature that He, the Creator, has created the laws and the properties of the universe and that no amount of human planning, no matter how sincerely motivated or how carefully implemented, can probe the depths of the creation that came into existence at His mere willing it so. The earth itself will end in God's good time, and it will end by fire, meaning that the events in California are meant to give us a foretaste of the destruction of the world at the end of time. God is, I believe, seeking to remind us that no created thing on this earth will last forever—certainly not any community named “Paradise” here on earth, that the end of our own particular lives can occur at any time. We are not to take even our next breath for granted. Everything good thing that we have, starting with the Holy Faith Itself, is His gratuitous gift to us. Then the Lord said to Satan: Behold, all that he hath is in thy hand: only put not forth thy hand upon his person. And Satan went forth from the presence of the Lord. Now upon a certain day when his sons and daughters were eating and drinking wine in the house of their eldest brother,  There came a messenger to Job, and said: The oxen were ploughing, and the asses feeding beside them,  And the Sabeans rushed in, and took all away, and slew the servants with the sword, and I alone have escaped to tell thee. We must never murmur against the will of God. Not once. Not ever. None of us ever suffers truly as his sins deserve. God is merciful even in the administration of his chastisements to those who love Him. The chastisement that is afflicting many in California, a leader in the worldwide exportation of evil laws, entertainment, music and decadent “culture,” at this time is meant not only for them. It is for us all. Although paganism is rampant in California, it is rampant in many other places in the United States of America as naturalism, which is really the state religion, if you will, of this country, has convinced even traditionally-minded Catholics that men do not need to pursue the common temporal good in light of man's Last End as they submit with humility and docility to the Catholic Church in all that pertains to the good of souls. Yes, the chastisement that has afflicted many in California is meant for us all. Time will tell whether the wildfires currently burning will spread much more before being contained. We must remember that the wildfires set by the sins that cry out to Heaven for vengeance that are protected under cover of the civil law and promoted all throughout what passes for "popular culture" in the United States of America and elsewhere in the “civilized” West must be punished. What a privilege it is for us, sinners who have helped to cause this wildfire of sins by our own infidelities and lukewarmness and inattentiveness to our interior lives of prayer and so unwilling to engage in voluntary acts of fasting and mortification and self-denial, to suffer here in this life so that we will be ready at all times to die a good death as we make sure to start each morning with our Morning Offering and our Acts of Faith, Hope, Charity and Contrition, mindful that each day God sees fit to give us might be our very last. Thank God upon arising in the morning that you are a Catholic, able to see the world through the eyes of the true Faith. Thank God throughout the day that you are a Catholic, willing to accept each bit of suffering and difficulty and rejection and humiliation as the means by which you can give Him honor and glory and to sanctify your immortal soul as a member of the Catholic Church and the consecrated slave of Our Blessed Lord and Saviour, Christ the King, through the Sorrowful and Immaculate Heart of His Most Blessed Mother, Mary our Immaculate Queen. Never be afraid of natural disasters and catastrophes. Never be afraid of who has criticized you or who has rejected your friendship or who has made life difficult for you. Indeed, be grateful to those who criticize you and reject you and make life difficult for you as they are the means sent to you by God to sanctify and save your souls. Men must quit their sins and repent of them in the Sacred Tribunal of Penance. They must treat each other as they would treat Our Blessed Lord and Saviour Jesus Christ, Who was made Flesh in Our Lady's Virginal and Immaculate Womb, where He spent nine months growing to the point of His Nativity in poverty and anonymity in Bethlehem on Christmas Day. No one can say that he loves Our Lord and yet supports His dismemberment mystically in the persons of innocent preborn children. And it is impossible to provide for any element of the common temporal good on an enduring basis as long as the innocent preborn are attacked with legal impunity, as long as the Sovereignty of God over the sanctity and fecundity of marriage is denied by means of contraception, as long as perversity is promoted under the slogans of "diversity" and "human rights," as long as men live as though there is no true Church and that they do not have to face Christ the King as their Judge at the moment of their Particular Judgments. We do not know how long it will be until Our Blessed Lord and Saviour Jesus Christ's Second Coming at the end of the world, which is why we must be prepared at all times for the end of our own lives. We do not know if the signs of natural disasters and cataclysms that are occurring at the time signify the nearing of Our Lord's Second Coming. What we can say for sure, however, is that truly extraordinary things are happening in our midst as a world that has gone mad with the conceits of the deification of man and his "rights." It is up to those of us who have the Faith to see the deeper supernatural significance of these events and to make more and more reparation for our sins, especially by praying as many Rosaries each day as our state-in-life permits. It is my belief, far from infallible, that God is indeed speaking to us through the events of nature, trying to demonstrate what appears to be some to be a terrible inconvenience and a source of material loss is symbolic symbolic of the horror of our own sins and the devastation that they wreak in our own souls and in the world-at-large. At the same time, however, God is also demonstrating the wonder of His creative handiwork, showing forth His own righteous power that baffles scientists and medical doctors who think that they have "answers" to even the physiological aspects of human existence. Our hope must then be in Our Lady, to whom we commend the particular needs of those suffering at this time. We trust in Our Lady to help us to save our own souls, nunc et in hora mortis nostrae. We must trust in Our Lady to save our souls from the destruction power of sin, even venial sin, in our own souls, which shone so brilliantly at the moment of our baptism but. We need to ask Our Lady every day to help us to be prepared for the moment of our own deaths, recognizing that we live at a time in salvation history when the forces unleashed by the social toleration and promotion of sin are exacting a heavy toll on us all and might take us from this mortal life when we least expect it. We do indeed need Our Lady's help so that our souls will not be lost for all eternity, which is why, of course, we must pray our Rosaries every day without fail and to pray them so very well. We never know when our next Rosary will be our last Rosary. And one way to avoid being burned for all eternity in the flames of Hell that emit sulphur dioxide—and from which there is no escape route—is to pray our Rosaries well as we meditate upon the mysteries contained therein, making sure also to be enrolled in and to wear and to fulfill the conditions of her Brown Scapular of Mount Carmel that protected four priests from the atomic blast in Hiroshima, Japan, on August 6, 1945. May it protect us today from the contagion of sin that can rob us of eternal glories in Heaven for all eternity.